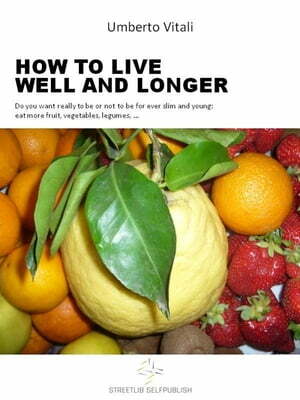 Collins Booksellers - Live well and longer by Umberto Vitali, 9786050455656. Buy this book online. The wrong life style, stress, food choices in improvised way are devastating for the health, wellness and live longer. It s necessary a quantity of knowledge, that are in this book, and to have the desire to lead better lifestyle to change improper habits as soon as possible. The change must be gradual and unforced, must mature consciously and personally experiencing the advantages against the disadvantages in applying the choices more suitable for everyone. At a certain point in our lives we must reflect on whether we prefer the pain, fatigue, sadness, depression, illness, or to be more serene, more active, live well and more long before it is too late. SO DO YOU WANT TO BE OR NOT TO BE, TO BE YOURSELF, REALLY TO EXIST OR TO BE DOMINATED BY A WRONG LIFESTYLE AND BY AN ARTIFICIAL FOOD?